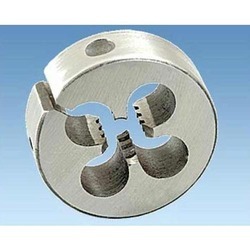 Our product range includes a wide range of carbon steel round die. H.S.S (High speed steel) Carbon Steel Round Die is widely appreciated for their features like high functionality and durability. These round die products are available in various sizes and shapes to meet the diverse requirements of customers. We manufacture and export these products using high quality raw materials and latest technologies comply with the international quality standards. We offer them at cost effective rates to our clients. Round Die Sizes : Available in MM /BSW/BSF/UNF/BSP/BA and Acme Thread Outer Dia -1",1.1/2",2",2.1/2",3",3.1./2" & 4"